Today, a story came out on National Public Radio about teaching children words via a new Sesame Workshop (the company that owns Sesame Street and associated products and media) app called “Big Bird’s Words,” the third piece in a 3-piece series on early literacy. In t his piece (available both in written and in audio form) Lynn Neary discusses the careful research that goes into the development of Sesame Workshop products. Now, in a perfect world, we would all take this story for just what it is–a piece about the value of literacy-based apps and the devices that they run on in the lives of young children and families (and frankly, an ad for the app, which is kind of bad form…more on that later.) But alas, we do not live in a perfect world. I spend a great deal of time thinking and writing, not about screen time (because surprise, despite all evidence to the contrary and that title up there, that’s actually not quite the topic of this post! ), but about the way in which the American public translates, consumes, and applies research (and doesn’t) to our work and lives with children. I guess I have been waiting for the right opportunity to talk here about that connection–the one between what we know and what we do, between research and practice. So let’s talk about it. Remember, screentime is primarily an illustration here–it’s the medium, not the message. Or maybe it’s the message, not the medium. Well, something like that. Before we begin, let me just say that I have no particular interest or investment in Sesame Workshop or this app, nor do I have an opinion about whether this app is a good choice for those who do purchase educational apps for young children. I do know, from a cursory search, that it won a couple of awards for best educational app in 2014, that Common Sense Media gave it a great review, and that it has very few customer reviews on ITunes which, taken in composite, basically communicate the message “Meh.” I do actually have a particular interest in the way in which this article portrays product research at Sesame Workshop, mostly because some time back, I held a Research Manager position there (when it was still known as Children’s Television Workshop) doing just that–product research. It was an interesting job (Yes, I met Elmo,) and I have mostly very positive memories, though I did leave with one powerful example that left me with an admittedly jaded view of their product research process, at least as it pertains to gender stereotypes (separate blog post in the works about that subject.) To be fair, it’s been almost 20 years. Maybe they do it differently now. I don’t know. It’s not my intent to disparage their work or process in any way. Cooney’s study, titled “Television for Preschool Education”, spelled out how television could be used to help young children, especially from low-income families, prepare for school. The focus on the new show was on children from disadvantaged backgrounds, but Cooney and the show’s creators recognized that in order to achieve the kind of success they wanted, it had to be equally accessible to children of all socio-economic and ethnic backgrounds. At the same time, they wanted to make the show so appealing to inner-city children that it would help them learn as much as children with more educational opportunities. This was the show’s primary criterion for success. Yes, others have watched it, and continue to watch it. No, within limits, it does no harm–although there exists a fascinating body of research linking attention deficit issues to the “rapid scene changes” and fast movement of shows, including (and sometimes especially) Sesame Street. Okay, so you found me out. In my professional work and life, people often think that my primary agenda lies in a particular sort of parent-child interaction. To be fair, yes, respectful and connected parenting is important to me. But it doesn’t hold a candle to my secret agenda, which is admittedly selfish. If I never again have to have a conversation that begins “research shows” and proceeds to ignore the intent, hypothesis, and subject pool of the study, I will be a happy woman. Research shows that we can just provide preschoolers with opportunities for exploration without “instruction” and they will progress wonderfully and be “ready for kindergarten,” and this should be our guiding principle for how preschools operate. Right. In relatively affluent homes in which there is a great deal of language, positive interaction, exposure to a range of materials and books from infancy onward, and frequent enrichment experiences, that’s all they need. For children who live in violence-ridden environments, in poverty, or in very high stress conditions, research shows it’s not enough. Research shows that Sesame Street and apps like Big Bird’s Words help children build language and contribute to better preparation for kindergarten (No, this post is not going to go into the validity–or lack thereof–of the entire concept of “kindergarten readiness” in 2014. That’s for another day.) Those gains and research are focused on populations in which children did not have rich exposure to language and enrichment in their early years. If you listen to NPR, statistically, that’s not you, because research shows that your kids are probably “ready for kindergarten” when they are three or four, whether they go to preschool or stay home. Research shows that Sesame Street and children’s television produces academic growth and good outcomes in low-income children. Research shows that parent education in infancy and toddlerhood and talking with your kids does much the same thing. 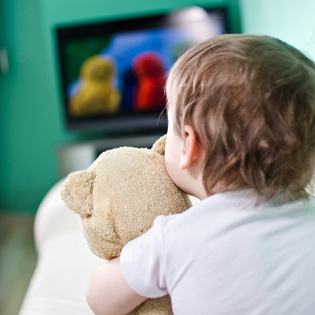 Research shows that toddlers watching tv for hours–even if it’s Sesame Street–is not good for kids. Even if it’s good tv, more does not equal better. Research shows that screen time is not good for young children. Research shows that screen time is good for young children. Research shows that if screen time is interactive, research findings about passive television watching do not adequately apply. Research shows that people of all socioeconomic groups are using technology with children, including infants and toddlers, often to excess, with unknown long term outcomes, regardless of what research shows. Research. Take it for what it is–not for what it is not. See if it applies to you. See if they’re talking about you. Examine whether they’re trying to sell you something (marketing and education are not synonyms.) Be aware that whatever study you’re citing, there’s probably a study that indicates the opposite. Context is everything. Everything is context. Yes. No doubt about it. Take care to remember that People are the best Interactive Platforms. Think. Get comfortable with ambiguity–the things that “research shows” are dwarfed by the things we know nothing about. Childhood does not go in reverse. None of us are immune from the laws of cause and effect–as we shape our children and their choices, we shape an unknown future. This entry was posted in media, parenting, policy, preschoolers, television, toddlers, Uncategorized and tagged child development, critical thinking, npr, research, screentime, sesame street, television. Bookmark the permalink.